Akron/Family's Seth Olinsky is getting into another side of the music biz, having announced he's founded a new record label with conceptual artist Ali Beletic. 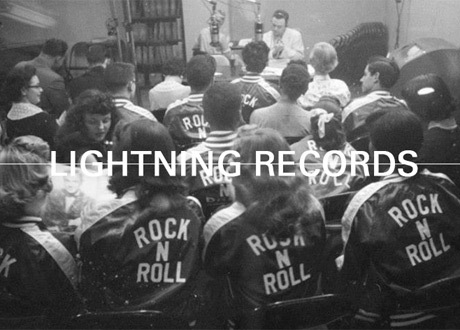 The pair's new venture is called Lightning Records, and they're planning on issuing a series of cassette releases from acts like Wooden Wand, Deerhoof's Greg Saunier, DMBQ/Boredoms' Shinji Masuko and more to get the label off the ground. The fledging label is hoping to do this via funds secured through a Kickstarter campaign. The label's "20 Artist Series," as you'd imagine by that title, will include 20 releases preserved on both handmade, limited-edition cassette and digital versions. Other acts roped into the series so far include Oneida offshoot People of the North, Sam Amidon, Cy Dune, Alan Bishop, Algae and Tentacles, William Tyler, Leverage Models, Ali Beletic, GDFX/Guardian Alien, Ohioan, Ghana Tape series, Nate Wooley and Chris Corsano Duo, American Culture, Art Fad, and David Daniell. "The Lightning handmade tapes will look beautiful and sound good too," the label said in a statement. "Not just a sonic choice, though, tapes are a connection to music as experience and fun. Tapes are a creative and inexpensive medium, driving a new and old tape underground, that not only provide our artists with an exciting medium to try out new ideas, but also a way for listeners to get back in touch with the joy, excitement, and simple pleasure of a real time music object shared with friends in physical space." The imprint won't just issue music, though, as it has announced plans to issue a publication called Lightning Journal, which is described as "an American counter culture journal with gonzo style articles written by artists, musicians, surfers, and people immersed in these vital cultures." A Lightning Quarterly subscription is being offered up, which will send out a package four times a year featuring the journal and five tape releases. Pledges are being taken now on Kickstarter, with other incentives including T-shirts, specially roasted coffee bags, flags, custom guitar pedals and more. You'll find out all the info over here, and you can peep a trailer about the project down below.